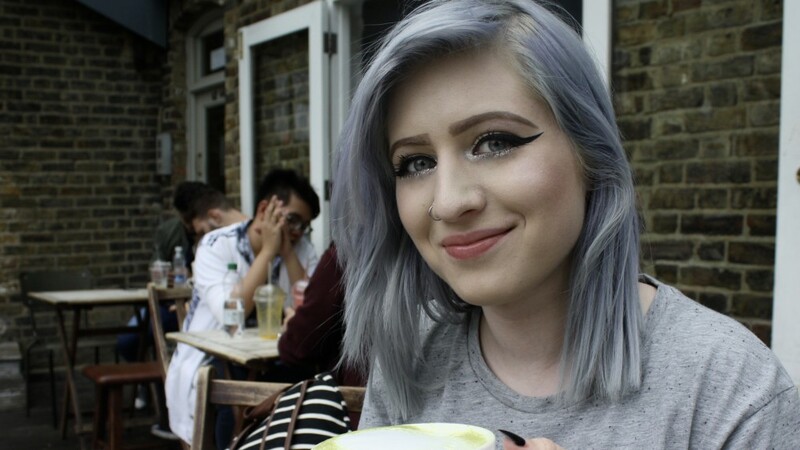 While my family was adventuring around London with me, we decided to get afternoon tea! Afternoon tea or high tea is a huge tradition for British people but it’s usually seen as a luxury nowadays. Many people save it for birthdays, holidays or other special occasions since it can be pricy and usually people just don’t have the time. It’s said to have started when Anna, the Duchess of Bedford, would complain of having an empty stomach between breakfast and dinner. She started afternoon tea because she would get really hungry around the afternoon time because her breakfast was so early and her dinner was usually around 8pm. Traditional afternoon tea consists of dainty finger sandwiches, scones, pastries and of course tea. 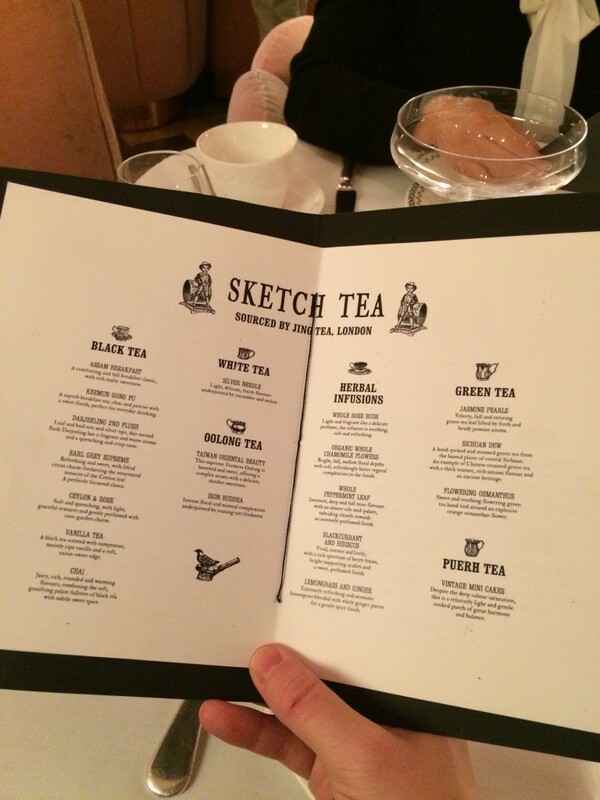 My sister, mother and I booked our reservation for The Sketch, a very modern,quirky afternoon tea spot. 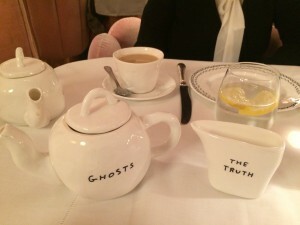 I was super excited to have afternoon tea, after hearing so much about cucumber sandwiches and tea time for so long and I really wasn’t even sure what to expect. After entering Sketch, I was amazed at how pink the dining room really was. The sofas and walls were all pink and the walls were plastered with modern art created by David Shrigley. The art was very quirky but I really enjoy modern art so I appreciated the whole set up of Sketch. The waiter came over, greeted us and handed us these cute little menus with all different kinds of tea. My mother decided to have earl grey tea, I opted for the chai and my sister got vanilla. After the server brought all of our teas over, he carried over a huge platter filled to the brim with little sandwiches and desserts. He then began to explain what everything was. 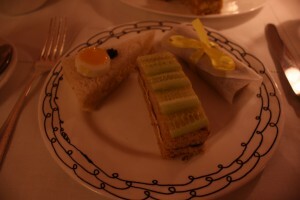 There was everything from the classic cucumber sandwiches to quail egg and caviar sandwiches! I got to say, I loved my chai tea, and I tried my mother’s and sister’s teas as well and they were both delicious! I have to say, I really found the dishes and cups to be entertaining and fun. 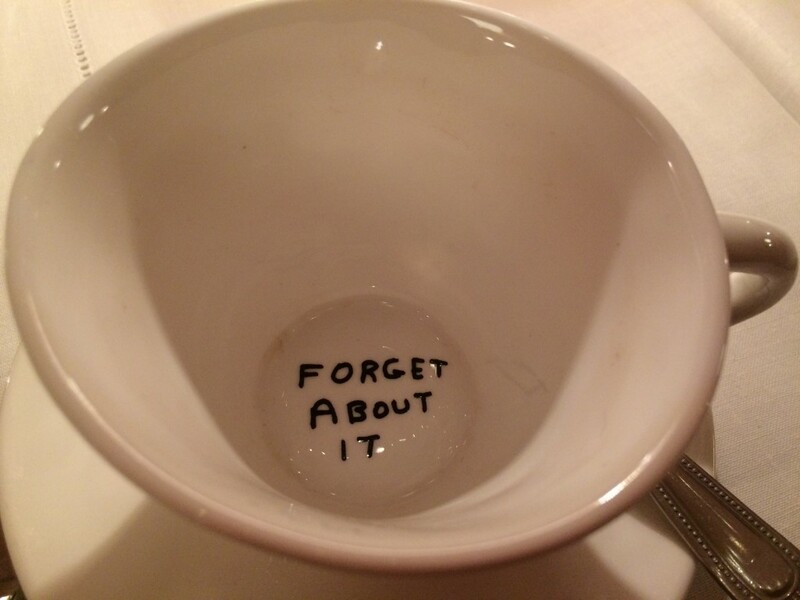 The cups and plates all had interesting doodles and designs on them. The sandwiches were very interesting! I really enjoyed some of them, and I tried to be daring and try all the different kinds of sandwiches (my mom and sister were less daring and stuck to the sandwiches with no quails egg or caviar haha). I have to admit, I am not a fan of fish eggs or caviar! I took one bite of the salmon and fish egg sandwich and my sister said my face shriveled up like a prune!! My sister and mother thought it was hilarious though and gave me credit for at least trying all the different sandwiches! 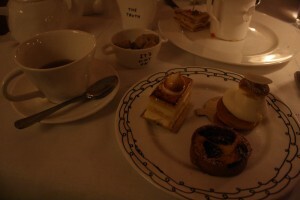 We all really enjoyed the pastries a lot more than the sandwiches and we basically scarfed down all of them. Surprisingly, after only eating dainty little desserts and finger sandwiches we were all quite full! 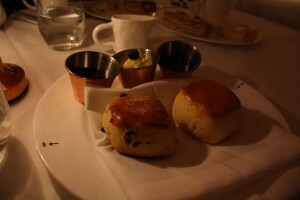 The server then brought over some scones with clotted cream and strawberry jam! They were still warm and really tasty, especially with the clotted cream and jam! After all that food we were all stuffed, but I really enjoyed getting afternoon tea. Although it was a little pricy, I feel like it’s worth doing at least once while here in London. It’s nice to just get tea and relax and chit chat with some people and experience something that has been going on for centuries! After finishing up with our tea, my sister and I headed to the bathroom to wash our hands and we felt like we walked into an alien habitat!! 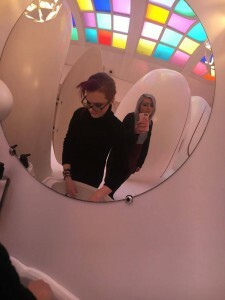 The bathrooms were so cool yet so strange. 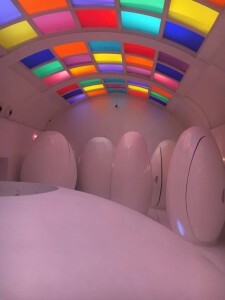 The toilets were in little private pods and there were rainbow lights! It was such an odd bathroom but really cool to experience. Although Sketch isn’t as much of a traditional afternoon tea spot and it’s more of a modern restaurant to get afternoon tea, it was really cool and it’s definitely a very lively, artistic place to visit! This entry was posted in Uncategorized by kayla_parker@student.uml.edu. Bookmark the permalink.